We continue to taste Wine of Moldova and we are heading towards the merlot wine zone – the most underrated red grape variety. There’s quite a competition on this market, as almost every winemaker is producing quality merlot wine, as a result, one can find high-end merlot wine without much effort. 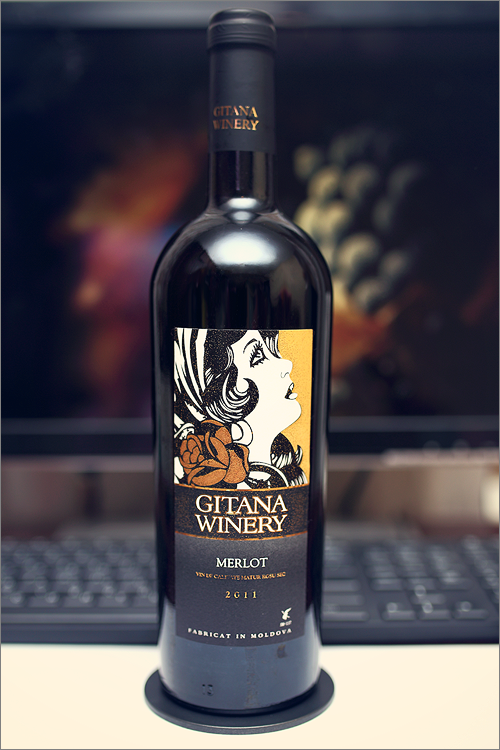 We’ve decided to follow the trend and picked for the review tonight a wine that is quite popular these days – Merlot 2011 from Gitana Winery. The wine has a hazy garnet color, it is quite opaque, with the rim-color showing some glimpses of purple shade. The nose is clean and rich with no signs of wine faults. The first nose unleashes nuanced notes of blue fruits and hints of barrel maturation: sour cherry, blue plum, cranberry, wolfberry, jostaberry, wormwood, red pepper, black pepper, tobacco and the noble-elegant aroma of a medium roasted oak-wood. The wine is extra dry and a bit green, with no signs of residual sugar. It has a high, but well integrated, alcohol level, high acidity and dry tannin. The wine feels expressive and tannic, with a nuanced new-world profile. It has a fair overall balance, as it feels bold, dense and persistent. This is a wine with a strong character. The wine has a long, bitter-seedy finish, with a balanced aftertaste – quite concentrated and zesty. This is definitely a fine Wine of Moldova and the overall rating says the same, with 89.8 points scored it is right there, among the best wines we’ve tasted so far. Please click on the chart icon on the left in order to get to the wine rating page, where you can find all the wines we’ve tasted to date. Last but not least, we would like to highlight the overall potential of a top quality merlot from Moldova, which is improving on the quality side with each new vintage. And this wine is no exception – powerful and bold, made in a fruit-forward, new world style, where barrel maturation dominates over variety – a wine with identity and character. And to be honest, we are impressed – this is not the first time we are, as a fine merlot wine is not a hard find anymore, even here in Moldova.